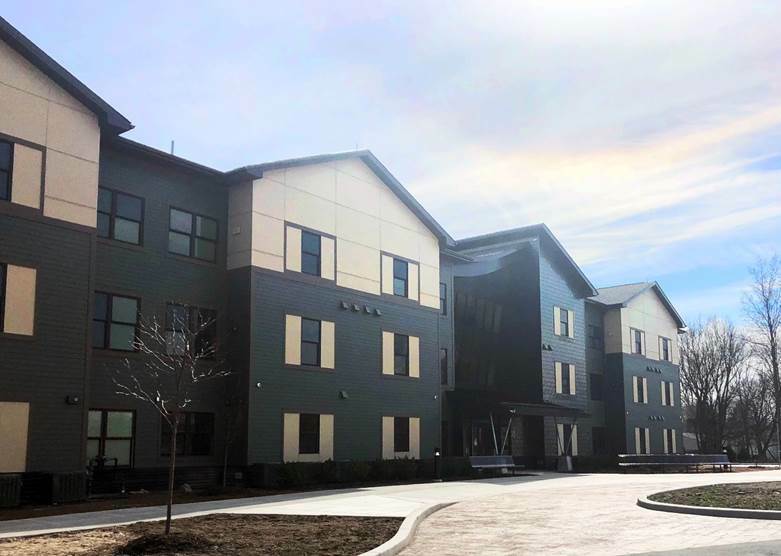 Governor Andrew M. Cuomo today announced the grand opening of the 60-unit, $17.7 million Packet Boat Landing Apartments in Lockport. The three-story, 62,000-square-foot affordable housing development features 60 new one-bedroom units, including 21 with supportive services. Named after the historic Erie Canal "Packet Boats," this development helps combat homelessness by combining affordability with supportive services. "Expanding affordable housing across New York is a top priority in order to ensure all New Yorkers have the opportunity to live independently within their communities," Governor Cuomo said. "Packet Boat Landing Apartments helps guarantee that Lockport residents, including the most vulnerable among them, can prosper in a compassionate community, building a better New York for all." "This project is another investment continuing the development and growth of Western New York's economy," Lieutenant Governor Kathy Hochul said. "We're focused on bringing more businesses and people to the area, while building new housing options that are convenient and inclusive. The State is dedicating billions of dollars to construct affordable housing developments to provide all New Yorkers with safe and affordable places to live." The Governor's commitment to providing all New Yorkers with access to safe, affordable housing is reflected in the State's unprecedented $20 billion, five-year Housing Plan. The plan makes housing accessible and combats homelessness by building or preserving 112,000 units of affordable housing, including 6,000 of supportive housing across the state. The plan is a comprehensive approach to statewide housing issues and includes multifamily and single-family housing, community development, and rent stabilization. Packet Boat Apartments is within a mile of health services, a grocery store and retail options. All apartments have fully equipped kitchens, a wall-mounted TV including basic cable service, and in-unit storage. Heat, air conditioning, hot water and electricity are included in the rent and community laundry facilities are available at no cost. Packet Boat Landing Apartments incorporates sustainable elements, including using Energy Star-rated appliances and lighting fixtures and high-efficiency furnaces and condensing units for heating and cooling. Tenants have access to a community room, lounges and a computer lab. Free Wi-Fi is available in common areas in the building. Photos of the development can be found here. The new apartments are available to area residents who earn up to 60 per cent of area median income. For a two-person household, the income limit is approximately $31,380 for a single person and $35,880 for a two-person household. New York State Homes and Community Renewal will provide nearly $12 million in permanent financing for the project in the form of tax exempt bond financing and Supportive Housing Opportunity Program subsidy loan. HCR's annual Federal tax credit allocation generated $5 Million in tax credit equity. Additional funding comes from New York State Office of Mental Health providing both rental and service subsidy for the supportive tenants. Since 2011, HCR has built or preserved 508 affordable homes in Niagara County with more than $43 million in HCR resources which have leveraged more than $73.5 million in other private and public sources. New York State Homes and Community Renewal Commissioner RuthAnne Visnauskas said, "Packet Boat Landing delivers the mix of affordability and supportive services that are essential in our fight against homelessness, and our ability to ensure that all New Yorkers can access the opportunity created by our growing economy. Under Governor Cuomo's leadership, we are creating and preserving integrated, safe and affordable homes in communities just like Lockport that help strengthen local economies." New York State Office of Mental Health Commissioner Dr. Ann Marie T. Sullivan said, "The supportive housing units in the Packet Boat Landing Apartments in Lockport will help individuals with mental illness to live and thrive in their own community. We at OMH are proud to work with our colleagues at HCR, helping to give our most vulnerable neighbors and opportunity to live, and thrive, in their community." Mark H. Fuller, DePaul Properties President said, "DePaul is pleased to be a community partner in meeting the need for quality affordable housing options in Lockport and throughout New York State. We wish to thank Governor Cuomo and the State for providing DePaul with the funding that has made this project a reality. Packet Boat Landing is an example of progress and partnership in action." New York State Energy Research and Development Authority President and CEO Alicia Barton said, "This project exemplifies New York's commitment to develop affordable housing for our most vulnerable individuals who are in need of a comfortable home and supportive services that provide them with opportunities to be active members of their local communities. Ensuring a better quality of life for all New Yorkers is paramount to Governor Cuomo, and that support starts at home."